Easy to install and monitor, Yale's SR-320 wireless burglar alarm is built with you in mind. The Yale SR-320 smart home alarm kit is a full wireless burglar alarm system designed to protect medium sized properties. With no wiring required, the only thing you need to add smart home security to your home is a broadband internet connection. This means you don't need to hire an electrician to install your home alarm system - home security has never been so convenient. As part of Yale's Smart Living security range, the SR-320 wireless alarm kit is easily connected to a wide range of compatible smart security products and accessories. This allows you to monitor and secure your home on the go, using your Android or iOS smartphone. With loud internal, and external sirens, intrusions are quickly identified and neighbours made aware. Additional notifications are sent to your email account and via SMS to notify you immediately of an intrusion, making it easy to quickly alert the authorities. While the alarm is armed the optional PIR Camera or optional PIR Video Camera will capture still images or video footage when either PIR detects movement. 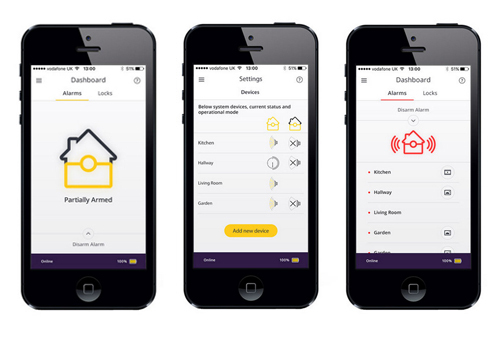 The images or video can then be viewed on your SmartPhone using the Yale Smart Home Alarm App.